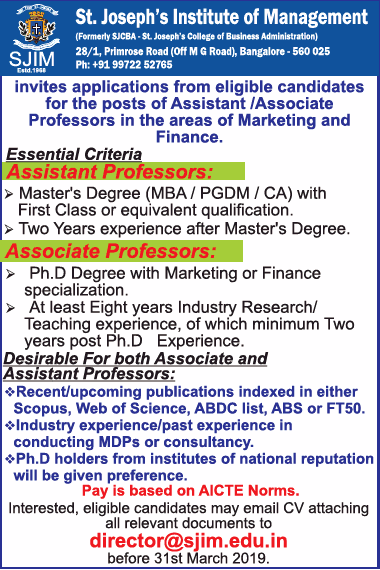 St.Joseph's Institute of Management, Bangalore has advertised in THE TIMES OF INDIA newspaper for recruitment of Teaching Faculty- Associate Professor / Assistant Professor jobs vacancies. Interested and eligible job aspirants are requested to apply on or before 31st March 2019. Check out further more details below. College Profile: The JOSEPHITE tradition started in Bangalore with the opening of the St. Joseph's European High School by the Paris Foreign Mission Fathers in 1858. In 1884, St. Joseph's College was established. It has grown steadily and today has more than 8000 students enrolled at the Undergraduate and Post Graduate courses in Arts, Science, Commerce, Computer and Management disciplines in its four independent Colleges namely, St. Joseph's College (Arts & Science), St. Joseph's College of Commerce, St. Joseph's Evening College and St. Joseph's College of Business Administration (SJCBA). The Jesuit Fathers, however, came into the picture in 1937 when the Paris Foreign Mission handed over all Joseph's Institutions to them. Master Degree / Ph.D. More details have been given below.